One would think that proper running form is proper running form. To a certain extent I believe that there are fundamental components to running that apply whether one is running on a treadmill, grass, a track, or the sidewalk. However, I’m keenly aware that I run different on the treadmill than I do on my outdoor routes. For starters, I use an ipod on the treadmill as I think it’s the only way to survive the boredom of running in place. I know that running with music outside distracts me from focusing on my form and breathing so there’s a good chance that the same things happens on the treadmill but it’s a sacrifice I’m willing to make in order to get in those runs. To get an idea of proper treadmill form, I paid close attention to my own form and position on the treadmill on my recent gym trip. Let’s just start with the ipod. I set it on the cup holder platform on the machine and the wires to the headphones seem to cross in front of my body in the exact area where my arm should also be moving. To compensate, I tend to swing my arms either a little lower or a little higher (depends on the day) to avoid the wires. The simple solution is to get an arm band that fits so that I don’t have to worry about the wires. However, even when I’ve run without the ipod, the angle of my arms always seems to be inconvenient. I have banged my knuckles many a time on the dashboard part of the machine. The knuckle banging dilemma is likely more related to where I stand on the treadmill than it is to how I pump my arms. Where do you stand on the treadmill? My husband has told me before that I stand too close to the screen part of the machine. I think I may have a minor fear of falling backward off the treadmill if I stand too far back so I tend to hug the front. I also like to constantly adjust my speed and incline on the treadmill, sometimes once a minute depending on the work-out I’m doing. Even though I have pretty long arms, I prefer to be within easy reach of the buttons and therefore I run incredibly close to the front of the treadmill. There are a couple components of form from outdoor running that I think apply equally to treadmill running. When I’m outside I usually focus my eyes on something several hundred feet in front of me or on what I consider the “horizon” of the street. This keeps my neck straight and prevents me from looking down at my feet. The treadmill is in the gym so while it should be just as easy to look straight ahead while running, there is much more to look at in the gym than on the street. I try to keep my focus straight ahead and find a spot on the wall in front of me to center on, but I’m a people-watcher, I can’t help it. As soon as something happens to my left or right, I usually give a quick glance to make sure I don’t miss anything. On my last treadmill run I noticed that I have a difficult time running in a straight line despite the fact that I am running in place. I constantly swerve from side to side of the treadmill but when I’m on the street I feel as though I can run in a consistent line. I assume the goal on the treadmill would be to stay in the center? While treadmill running is not necessarily my favorite way to log miles there will always be times when running outside is just not an option. 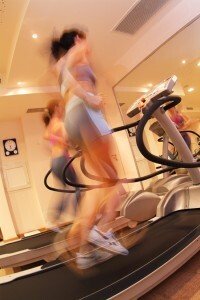 Like any other exercise or form of running, I believe treadmill running takes practice. Perhaps I’ll start with getting those headphone wires out of my way. This entry was posted in Running and tagged ipod, running form, treadmill on April 22, 2009 by Natalie. GREAT post. I live in FL so don’t use the treadmill that much with the exception of hill runs (since it is flat here 🙂 and you have GREAT tips!! Thanks for sharing! Glad it’s helpful Kellie! Do you run on the beach much? I have to imagine running in the sand presents its own challenges, but ones that would totally be worth figuring out just to be on the beach! Hey Natalie, How do you overcome the issue of not being able to run in a straight line? I try to run on the treadmill, but I sway way to much to the point of nearly falling off. I found that, while not ideal, I have to hold on. Any suggestions? Hi Kyle, Thanks for checking out the blog. I continue to find that running in a straight line is also still a little challenging on the treadmill. I used to look down a lot and I think the more I looked at my feet the more crooked I ran. Now I tend to fixate on something directly in front of me and stare at that rather than my feet and I think I run straighter. It’s also helpful to make sure you’re going at a pace and incline that you feel you have control over. Also, your arms will provide you more balance if you pump them rather than hold on. Try relaxing your shoulders and keeping your arms bent at a 90-degree angle and pump them in rhythm with your stride. If you search on this blog for the post “Treadmill Ten” there is a whole string of comments loaded with advice for treadmill running and you might find some additional helpful tips there. Hopefully this is a helpful start! Like anything though, practice is probably what will help make the most difference.